● ● ● 66 • FOODSERVICE EQUIPMENT & SUPPLIES • OCTOBER 2018 chain profile room. There was not a clear connection between them. We wanted it to feel like one unified space, so we moved that fire- place element to the exterior of the building," Williams says. While the designers wanted an open aesthetic, they didn't want the restaurant to be too boxy. To help break up the space, they placed a banquette along the border of the bar and dining room paired with a metal divider with chevron-like patterns. Seating in the dining room includes booths, banquettes and four-tops, all made with a white solid surface material that helps brighten the space. One of the defining features of the dining room is a large server station that was originally designed as a community table. While used for guest seating, the community table congested the space. 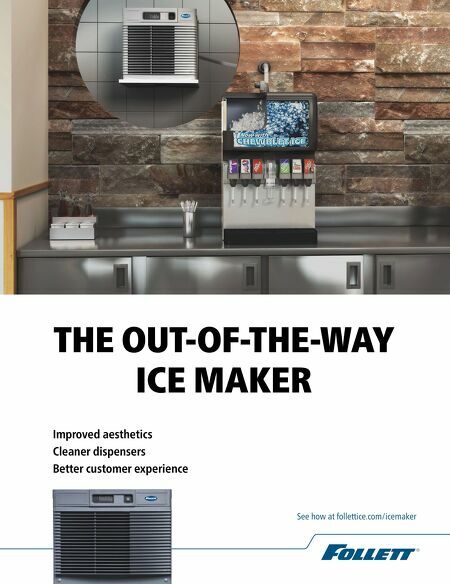 Revitalized as a server station, it lets floor staff serve guests more quickly and allows the restaurant to showcase its sparkling water in an elevated manner. The water is displayed in clear glass bottles, chilled in a metal tub. The most eye-catching element of the dining room, though, is the window into the kitchen. According to Loftis, this provides an "intentional view" of the centerpiece of the chain's operation and its brand: the wood-fired grill. Intentional View, Intentional Design This view into Firebirds' kitchen represents a change from the previous design, says Executive Chef Steven Sturm. In earlier stores, guests were given a much more open look into the pro- duction area. Now, the view frames the action of the grill, with no signifi- cant exposure to the less glamorous aspects of the back of the house. "We've always thought that having the open kitchen gave our guests that dinner and a show feel," says Sturm. "It begins and ends with that wood-fired grill. 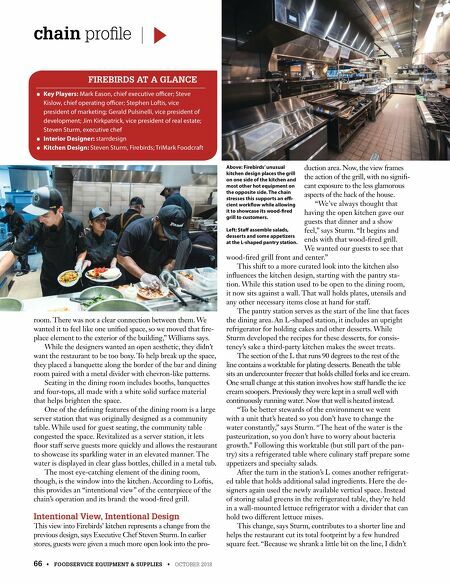 We wanted our guests to see that wood-fired grill front and center." This shift to a more curated look into the kitchen also influences the kitchen design, starting with the pantry sta- tion. While this station used to be open to the dining room, it now sits against a wall. That wall holds plates, utensils and any other necessary items close at hand for staff. The pantry station serves as the start of the line that faces the dining area. An L-shaped station, it includes an upright refrigerator for holding cakes and other desserts. While Sturm developed the recipes for these desserts, for consis- tency's sake a third-party kitchen makes the sweet treats. The section of the L that runs 90 degrees to the rest of the line contains a worktable for plating desserts. Beneath the table sits an undercounter freezer that holds chilled forks and ice cream. One small change at this station involves how staff handle the ice cream scoopers. Previously they were kept in a small well with continuously running water. Now that well is heated instead. "To be better stewards of the environment we went with a unit that's heated so you don't have to change the water constantly," says Sturm. "The heat of the water is the pasteurization, so you don't have to worry about bacteria growth." Following this worktable (but still part of the pan- try) sits a refrigerated table where culinary staff prepare some appetizers and specialty salads. After the turn in the station's L comes another refrigerat- ed table that holds additional salad ingredients. Here the de- signers again used the newly available vertical space. Instead of storing salad greens in the refrigerated table, they're held in a wall-mounted lettuce refrigerator with a divider that can hold two different lettuce mixes . This change, says Sturm, contributes to a shorter line and helps the restaurant cut its total footprint by a few hundred square feet. "Because we shrank a little bit on the line, I didn't ● Key Players: Mark Eason, chief executive officer; Steve Kislow, chief operating officer; Stephen Loftis, vice president of marketing; Gerald Pulsinelli, vice president of development; Jim Kirkpatrick, vice president of real estate; Steven Sturm, executive chef ● Interior Designer: starrdesign ● Kitchen Design: Steven Sturm, Firebirds; TriMark Foodcraft FIREBIRDS AT A GLANCE Above: Firebirds' unusual kitchen design places the grill on one side of the kitchen and most other hot equipment on the opposite side. The chain stresses this supports an effi- cient workflow while allowing it to showcase its wood-fired grill to customers. Left: Staff assemble salads, desserts and some appetizers at the L-shaped pantry station.